The concert opens in semi-darkness, with the 25-strong Estonian choir arrayed at the front of the stage, unspooling the shifting textures of Pärt’s Da pacem Domine, written in memory of the Madrid train bombings of 2004, the basses primal, almost growling, in the low register and the sopranos luminous. The lights go up on Bach’s Komm, Jesu, Komm,BWV229, and the singers scatter to either side of the stage (splitting into the two antiphonal choirs required for the motet) and revealing the small forces of a reduced ACO, who with the choir conjure the hypnotic stillness of the Pärt into the weaving lines of Bach with organic ease. The choir’s sound is lean and clear, bursting into the bright joy of the repeated “Komm”s against the orchestra’s pizzicati. 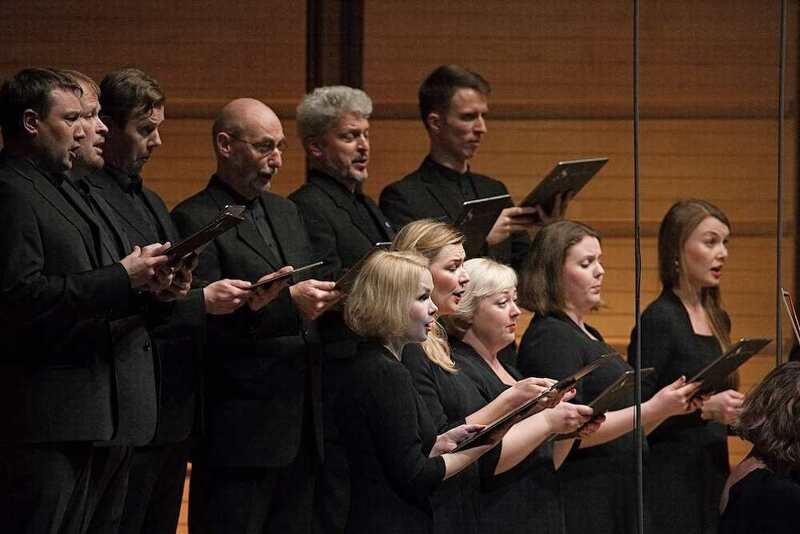 While there were one or two moments in this concert, at least at the opening performance, when the choir’s pitch wavered ever so slightly in the sopranos, and there were a couple of uncertain entries in the Mass’s Credo(a major-key reworking of the setting upon which Summe is based), the Estonian Philharmonic Chamber Choir gave a compelling, emotive performance and the Berliner Messe persuasivelybound the program’s threads together. The “in gloria Dei Patris” climax of the Gloria is ecstatic while the dark rolling of the Veni Sancte Spiritus is perhaps a highlight of the program. The gentle Agnus Dei offers a final taste of the transcendence common to both Bach and Pärt, a sweet end to a beautiful concert.